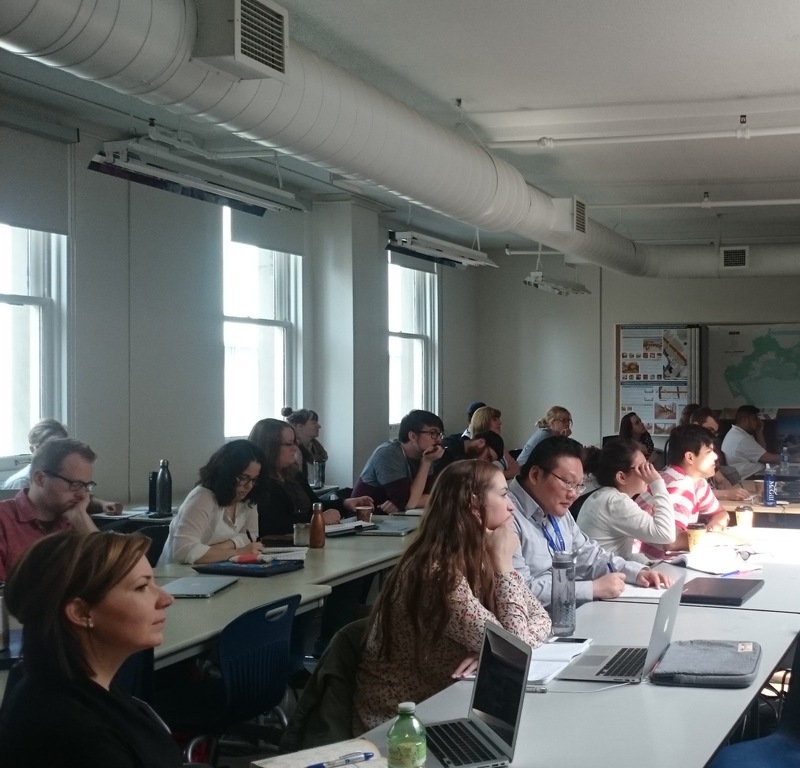 Geothink’s 2016 Summer Institute took place the second week of May at Ryerson University in Toronto with 35 students in attendance. We’re very excited to present you with our 11th episode of Geothoughts. You can also subscribe to this Podcast by finding it on iTunes. In this episode, we take a look at the just concluded 2016 Geothink Summer Institute. Students at this year’s institute learned difficult lessons about applying actual open data to civic problems through group work and interactions with Toronto city officials, local organizations, and Geothink faculty. The last day of the institute culminated in a writing-skill incubator that gave participants the chance to practice communicating even the driest details of work with open data in a manner that grabs the attention of the public. Held annually as part of a five-year Canadian Social Sciences and Humanities Research Council (SSHRC) partnership grant, each year the Summer Institute devotes three days of hands-on learning to topics important to research taking place in the grant. This year, each day of the institute alternated lectures and panel discussions with work sessions where instructors mentored groups one-on-one about the many aspects of open data. The 2016 Geothink Summer Institute wrapped up during the second week of May at Ryerson University in Toronto. Held annually as part of a five-year Canadian Social Sciences and Humanities Research Council (SSHRC) partnership grant, each year the Summer Institute devotes three days of hands-on learning to topics important to research taking place in the grant. The 35 students at this year’s institute learned difficult lessons about applying actual open data to civic problems through group work and interactions with Toronto city officials, local organizations, and Geothink faculty. The last day of the institute culminated in a writing-skill incubator that gave participants the chance to practice communicating even the driest details of work with open data in a manner that grabs the attention of the public. On day one, students confronted the challenge of working with municipal open data sets to craft new applications that could benefit cities and their citizens. The day focused on an Open Data Iron Chef that takes it name from the popular television show of the same name. Geothink.ca spoke to the convener of the Open Data Iron Chef while students were still hard at work on their apps for the competition. For many students, the experience was a memorable one. Groups found the competition interesting as they worked to conceptualize an application for most of the afternoon before presenting it the institute as a whole. That’s Mark Gill, a student in attendance from the University of British Columbia, Okanagan. His group worked with open data from the Association of Bay Area Governments Resilience Program to better inform neighborhoods about their level of vulnerability to natural hazards such as earthquakes, floods, or storms. The application they later conceptualized allowed users to measure their general neighborhood vulnerability. 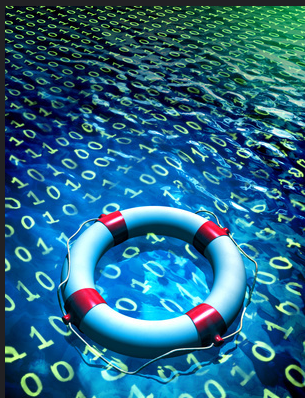 Specific users could also enter their socioeconomic data to gain their own individual vulnerability. On day two, students heard from four members of Geothink’s faculty on their unique disciplinary perspectives on how to value open data. 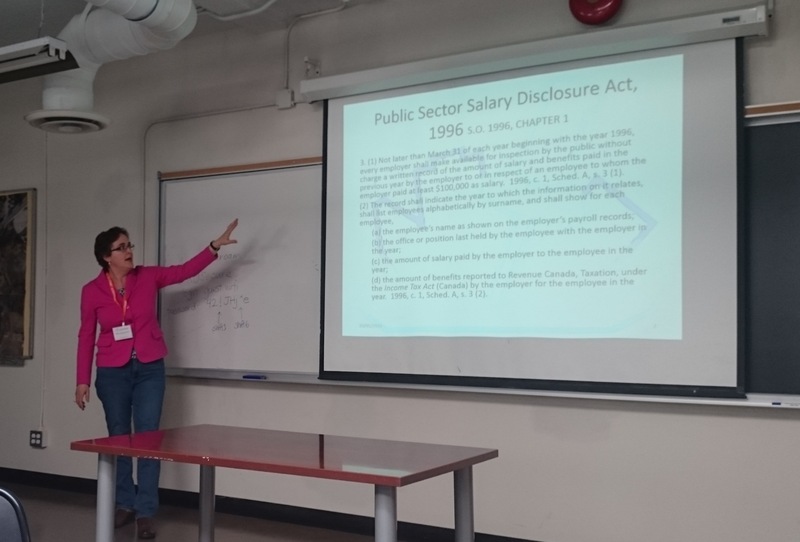 Here we catch up with Geothink Head Renee Sieber, an associate professor in McGill University’s Department of Geography and School of Environment, as she provided students a summary of methods for evaluating open data. Sieber started her talk by detailing many of the common quantitative metrics used including the counting of applications generated at a hackathon, the number of citizens engaged, or the economic output from a particular dataset. After hearing from the four faculty members, students spent the rest of the day working in groups to first create measures to value open data, and, second, role-play how differing sectors might use a specific type of data. In between activities on day two, students also heard from a panel of municipal officials and representatives of Toronto-based organizations working with open data. On day three, students transitioned to taking part in a writing-skills incubator workshop run by Ryerson University School of Journalism associate professors Ann Rahaula and April Lindgren. Students were able to learn from the extensive experience both professors have had in the journalism profession. For most of her talk, Lindgren focused on three specific strategies. Both Lindgren and Rahaula emphasized how important it is for academics to share their work to make a difference and enrich the public debate. Such a theme is central to Geothink, which emphasizes partnerships between researchers and actual practitioners in government, private, and non-profit sectors. Such collaboration makes possible unique research that has direct impacts on civil society. 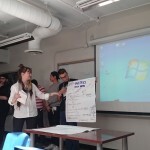 At the institute, this focus was illustrated by an invitation Geothink extended to Civic Tech Toronto for a hackathon merging the group’s members with Geothink’s students. Taking place on the evening of day two, the hack night featured a talk by Sieber and hands-on work on the issues Toronto citizens find most important to address in their city. Much like the institute itself, the night gave students a chance to apply their skills and knowledge to real applications in the city they were visiting. This entry was posted in Geothoughts Podcasts and tagged 2016 summer institute, Ann Rauhala, April Lindgren, Geothink, itunes, Mark Gill, open data, open data iron chef, podcast, Renee Sieber, writing-skills incubator on May 27, 2016 by Drew Bush. Peter Johnson was one of four Geothink Co-Applicants who gave presentations on day two of the 2016 Geothink Summer Institute. Listen to their lectures here as podcasts. Geothink’s Summer Institute may have concluded but, for those of you who missed it, we bring you four talks to remember. 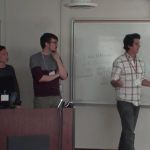 These lectures come from day two of the institute when four Geothink faculty members gave short talks on their different disciplinary approaches to evaluating open data. The lectures feature Peter Johnson, an assistant professor at Waterloo University’s Department of Geography and Environmental Planning; Teresa Scassa, Canada Research Chair in Information Law at the University of Ottawa; Pamela Robinson, associate professor in Ryerson University’s School of Urban and Regional Planning; And, Geothink Head Renee Sieber, associate professor in McGill University’s Department of Geography and School of Environment. 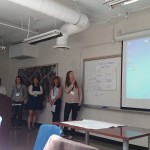 Students at this year’s institute learned difficult lessons about applying actual open data to civic problems through group work and interactions with Toronto city officials, local organizations, and Geothink faculty. The last day of the institute culminated in a writing-skill incubator that gave participants the chance to practice communicating even the driest details of work with open data in a manner that grabs the attention of the public. Below we present you with a rare opportunity to learn about open data with our experts as they discuss important disciplinary perspectives for evaluating the value of it. You can also subscribe to these Podcasts by finding them on iTunes. Join Peter Johnson as he kicks off day two of Geothink’s 2016 Summer Institute by inviting students to dream that they are civil servants at the City of Toronto when the city receives a hypothetical “F” rating for its open data catalogue. From this starting premise, Johnson’s lecture interrogates how outside agencies, academics, and organizations evaluate municipal open data programs. In particular, he discusses problems with current impact studies such as the Open Data 500 and what other current evaluation techniques look like. Teresa Scassa starts our fifth talk by discussing how those working in the discipline of law don’t usually participate in the evaluation of open data. While those in law don’t actually evaluate open data, however, legal statutes often are responsible for mandating such valuation, she argues. In particular, legal statutes often require specific types of data to be open. Furthermore, provisions in Canadian law such as the Open Courts Principle mean that many aspects of Canada’s legal system can be open-by-default. Pamela Robinson dispels the notion that open data derives value from economic benefits by instead discussing how such data can be used to fundamentally shift the relationship between civil society and institutions. She elaborates on this idea by noting that not all open data sets are created equal. Right now, she argues, the mixed ways in which open data is released can dramatically impact whether or not it’s useful to civic groups hoping to work with such data. In a talk that helps to summarize the previous three presenters, Renee Sieber discusses the different ways in which open data can be evaluated. She details many of the common quantitative metrics used—counting applications generated at a hackathon, the number of citizens engaged, or the economic output from a particular dataset—before discussing some qualitative indicators of the importance of a specific open data set. Some methods can likely capture certain aspects of open data better than others. She then poses a series of questions on how one can actually attach a value to the increased democracy or accountability gained by using open data. This entry was posted in Geothoughts Podcasts and tagged evaluation, Geothoughts, Geothoughts talks, lectures from summer institute, open data, Pamela Robinson, Peter Johnson, Renee Sieber, Teresa Scassa, value on May 25, 2016 by Drew Bush. Day two of Geothink’s 2016 Summer Institute began with short lectures on specific disciplinary perspectives on open data. Teresa Scassa, Canada Research Chair in Information Law at the University of Ottawa, gave a legal perspective on the value of open data. Day two of the 2016 Summer Institute began with presentations from Geothink’s faculty that aimed to provide different disciplinary approaches to evaluating open data. Armed with this information, students spent the rest of the day working in groups to first create measures to value open data, and, second, role-play how differing sectors might use a specific type of data. The morning began with 30-minute presentations from members of Geothink’s faculty. 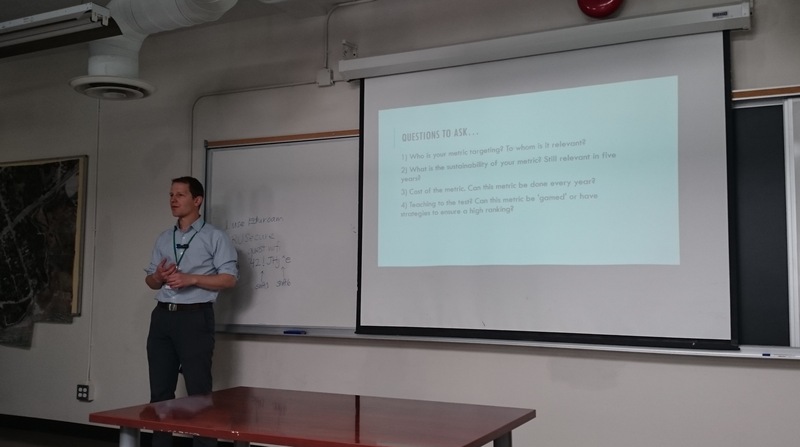 Peter Johnson, an assistant professor at Waterloo University’s Department of Geography and Environmental Planning, led off with a presentation on how municipal governments evaluate the success of their open data programs. Johnson was followed by Teresa Scassa, Canada Research Chair in Information Law at the University of Ottawa, with a legal perspective on the value of open data. Pamela Robinson, associate professor in Ryerson University’s School of Urban and Regional Planning, gave a civic-oriented approach to the value of open data, one that was intentionally at odds with the private sector. Finally, Geothink Head Renee Sieber, associate professor in McGill University’s Department of Geography and School of Environment, provided a summary of the methods for evaluating open data. Each of these short lectures were part of a comprehensive look at open data during the three-day institute. Students at this year’s institute learned difficult lessons about applying actual open data to civic problems and on how to evaluate the success of an open data program. 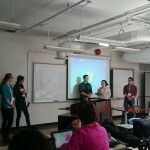 In between activities on day two, students also heard from a panel of municipal officials and representatives of Toronto-based organizations working with open data. But many students struggled not only with thinking about how to evaluate the open data that they were working with, but also with how to determine the impact of any project that utilizes such an information source. It is for such reasons that evaluating open data can be quite nuanced—an idea represented in student group presentations on the topic. The presentations varied greatly with some student groups choosing metrics based on the things that a community might value and then establishing an outside monitor to observe datasets and report back to the community. Other students established a workflow to harness citizen input to evaluate open data through instruments such as online surveys. Group one evaluated open data metrics based on whether they were representative of a community. Group two established a workflow to harness citizen input to evaluate open data through instruments such as online surveys. Group three took on the role of being an independent watch dog auditing open data based on public engagement. Group four utilized a framework for evaluating open data that came from the Canadian Standards Association. Group five sought to measure open data portals by the quality of the data they provide. Group six argued that each open data set is unique and therefore concluded one standard would not work for them all but that citizen engagement may provide insight. 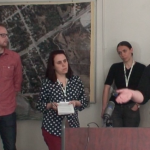 An afternoon panel comprised of local city officials and representatives from groups concerned with open data discussed the practical side of publishing, using, and evaluating open data as it stands today. The panel included Keith McDonald, former open data lead for City of Toronto; Bryan Smith, co-founder and Chief-Executive-Officer of ThinkData Works; Marcy Burchfield and Vishan Guyadeen, from The Neptis Foundation; And, Dawn Walker and Curtis McCord, Geothink students from University of Toronto who designed the Citizen’s Guide to Open Data. Two of the primary concerns shared by panelists included the lack of standards for which differing municipalities provide open data, and the gap that exists between how open data is provided and what businesses or citizens require to actually use it. Smith spoke of how early visions of students and application developers using open data to radically transform life in cities have not scaled up to the national level particularly well. “What we are seeing, which I don’t think anyone predicted, is the large companies—mostly companies that run a bunch of apps that probably everyone here has on their phones—are the ones who are the biggest purveyors of open data,” Smith told students. Issues with the type and quantity of data (as well as differences between how data is provided in different places) have limited other players and even some of these big developers too. For more on this discussion, check out an excerpt of the panel discussion below. We pick up the discussion as the panelists talk about standards in relation to the Open Government Partnership. In role-playing activities, students considered the issues raised by the panel as well as the practical problems citizens or other groups might face in finding the open data they require. Concluding presentations included those from students playing the role of real estate developers, non-profits concerned with democracy, and a bicycle food courier service. Stay tuned for the full audio of each professors’ talk presented as podcasts here. Also check back on Geothink for a synopsis of day three, and, of course, watch more of our video clips (which we’ll be uploading in coming days) here. If you have thoughts or questions about this article or the videos, get in touch with Drew Bush, Geothink’s digital journalist, at drew.bush@mail.mcgill.ca. 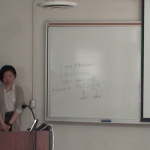 This entry was posted in Geothink Videos and tagged Bryan Smith, Curtis McCord, Dawn Walker, Geothink, Keith Mcdonald, Marcy Burchfield, open data, Pamela Robinson, Peter Johnson, Renee Sieber, Ryerson University, Summer Institute 2016, Teresa Scassa, Toronto, Vishan Guyadeen on May 20, 2016 by Drew Bush. A McGill University undergraduate has undertaken unique research on the governance of Toronto’s Makerspaces. We’re very excited to present you with our tenth episode of Geothoughts. You can also subscribe to this Podcast by finding it on iTunes. In this episode, we examine a project funded by McGill University Arts Undergraduate Research Internship Award (ARIA) and Geothink. In it, one student has found a huge variance between the types of Makerspaces found in Toronto. The city’s groups represent what McGill University Undergraduate Jordan Bowden calls a unique Canadian evolution of the Makerspace concept. He worked with Geothink Head Renee Sieber, associate professor in McGill University’s Department of Geography and School of Environment. A Makerspace is a place where people come together and share commonly owned tools, equipment, or software to learn new skills. They can be for profit, they can be non-profit, they can be run by a group of individuals, or by larger institutions like universities or libraries. First popular in China and other Asian countries, these do-it-yourself (DIY) spaces where people can gather to create, invent, and learn have also spread to the United States and, more recently, Canada. Many of Canada’s Makerspaces face little formal regulation and differ greatly from their formulations than in other countries. That’s McGill University Undergraduate Jordan Bowden on his unique yearlong honours thesis project investigating how governance works in 10 different Toronto Makerspaces. He’s a long-time participant in the work being done in Makerspaces. He also recently completed his thesis for Geothink Head Renee Sieber, associate professor in McGill University’s Department of Geography and School of Environment. Still confused about how to define a Makerspace? You might not be alone, as the concept has varied and evolved as it has spread globally. Bowden says that the question of how such spaces are governed in Canada is an entirely new one. And he adds that it’s crucial: What Makerspaces can actually do is greatly affected by how they are run. The project took Bodwen a great deal of time to research, conduct field work for, and then write about in the fall and winter of this academic year. Not every hypothesis that Bowden hoped to explore panned out in the Canadian context of Toronto. This work led Bowden to author a 63-page honours thesis entitled “Governance of Makerspaces in Toronto, Canada.” Find this paper at the McGill University library soon. 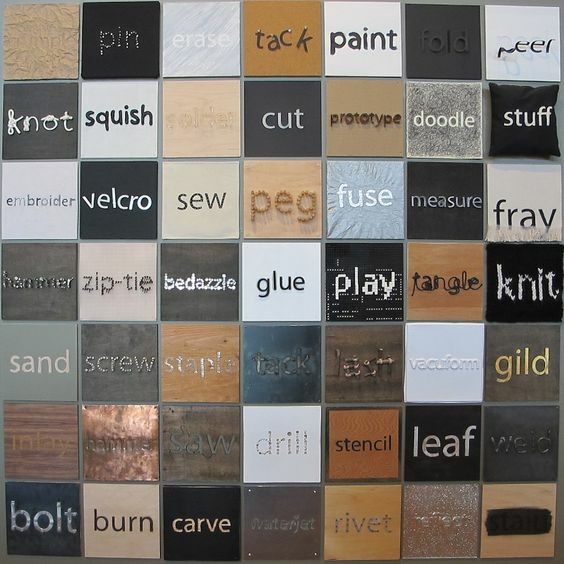 This entry was posted in Geothoughts Podcasts and tagged ARIA Grant, Geothink, Geothoughts, honours thesis, Jordan Bowden, makerspaces, Mcgill University, podcast, Renee Sieber, Toronto, undergraduate on April 22, 2016 by Drew Bush. 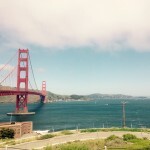 From March 29 to April 2, 2016, Geothink’s students, co-applicants, and collaborators presented their research and met with colleagues at the now concluded 2016 Association of American Geographers (AAG) Annual Meeting in San Francisco, CA. Over the week, Geothinkers gave 11 presentations, organized six sessions, chaired five sessions, and were panellists on four sessions. See who attended here. Of particular note for Fast was Panel Session 1475 Gender & GIScience (see her Geothink.ca guest post here). Panelists in the session included Geothink Head Renee Sieber, associate professor in McGill University’s Department of Geography and School of Environment; And, Geothink collaborator Sarah Elwood, a professor in University of Washington’s Department of Geography. “A panel on gender and GIScience was refreshing and enlightening,” Geothink Co-Applicant Scott Bell, a professor of Geography and Planning at University of Saskatchewan, wrote to Geothink.ca. For others, the high cost of the location meant they couldn’t stay for a full week or attend every single session. Still they reported good turnout by members of the Geothink team. Many Geothinkers were also intimately involved in running parts of the conference. 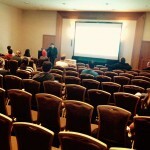 For some students, it was the first time they had attended the meeting or presented their own research. The AAG annual meeting has been held every year since the association’s founding in 1904. This year’s conference included more than 9,000 attendees. If you have thoughts or questions about this article, get in touch with Drew Bush, Geothink’s digital journalist, at drew.bush@mail.mcgill.ca. We also want to thank Victoria Fast for her willingness to share photos from the 2016 AAG Annual Meeting. Please find an abstract for the presentation mentioned in this article below. In the past decade society has entered a technological period characterized by mobile and smart computing that supports input and processing from users, services, and numerous sensors. The smartphones that most of us carry in our pockets offer the ability to integrate input from sensors monitoring various external and internal sources (e.g., accelerometer, magnetometer, microphone, GPS, wireless internet, Bluetooth). These relatively raw inputs are processed on the phones to provide us with a seemingly unlimited number of applications. Furthermore, these raw inputs can be integrated and processed in ways that can offer novel representations of human behavior, both dissagregate and aggregate. As a result, new opportunities to examine and better understand human spatial behaviour are available. An application we report here involved monitoring of a group of people over an extended period of time. Monitoring is timed at relatively tightly spaced intervals (every 2 minutes). Such a research setting lends itself to both planned and natural experiments; the later of which emerge as a result of the regular and on going nature of data collection. We will report on both a natural experiment and planned observations resulting from 3 separate implementations of our smartphone based observations. The natural experiment that emerged in the context of our most recent month-long monitoring study of 28 participants using mobile phone-based ubiquitous sensor monitoring will be our focus, but will be contextualized with related patterns from earlier studies. The implications for public health and transportation planning are discussed. This entry was posted in Refereed Publications & Conferences and tagged AAG, aag2016, American Association of Geographers, annual meeting, at, decision support systems, Geothink, Renee Sieber, Sarah Elwood, Scott Bell, Suthee Sangiambut, Teresa Scassa, Victoria Fast on April 15, 2016 by Drew Bush. Female mentors in GIS abound at the 2016 American Association of Geographers (AAG) Annual Meeting. This post was originally published on GIS2 at Ryerson University: Geographic Information Science and Systems on April 6, 2016. We re-publish it here with permission of Dr. Victoria Fast who presented at this year’s Annual Meeting of the American Association of Geographers (AAG). Roger Tomlinson has passed, and Mike Goodchild is in (a very active) retirement. 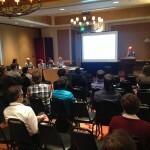 So, this panel made me consider: are we searching for a new father of GIS? In fact, do we need a father of GIS? Would a mother of GIS balance the gender scales? It seems all disciplines need leaders, and the powerful panellists in this session—populated with many of my mentors and leaders in the field, including Renee Sieber, Nadine Schuurman, Sarah Elwood, Agnieszka Leszczynski, Britta Ricker, and Matthew Wilson—demonstrates that we indeed have strong leadership in GIScience. This mostly female panel is a reminder that, in fact, there are many influential female scholars. But do we hear these influences? Do we hear them equally? Have we heard them in the past? Based on the discussion in this session, the answer in overwhelmingly ‘no’. The discussion in this session revolved around the ways in which our science has been heavily masculinized, epitomized by the commonly accepted ‘Father of GIS’ notion. The discipline has been dominated by all-male panels, focused on programming and physical science, subdued critical or theoretical work, and “straight up misogyny in GIScience” (Renee Sieber’s words). Female scholars are less frequently cited, underrepresented as researchers in the field, and almost absent in the representation of the history of the discipline. This made me think of deep-rooted masculinization I have faced in my GIS journey, as a student and now as an educator. Issues related to working in the ‘old boys club’ aside, masculinization was especially predominant when I taught a second year Cartography course. The textbook “Thematic Cartography and Geovisualization” contains a chapter of the History of Cartography. Without sounding ‘…ist’ myself, the chapter largely recognized the contribution of older, white males. I didn’t feel comfortable teaching my students that narrow history of Cartography, so instead went looking for my own resources to populate a ‘History of Cartography’ lecture. I recognize that it is impossible to undo the deep-rooted masculinization that has persisted in GIScience. However, we can change how we address it moving forward. Let’s recognize that we don’t need a father (or mother) of GIS; we need leaders, visionaries, and mentors of all shapes, sizes, colours, backgrounds, and genders. I challenge all those who are GI Professionals in training to look for the untold story, the hidden history of GIS, and the little-seen influences on the discipline. I challenge those who teach GIS to go beyond the ‘truth’ presented in the textbooks. And lastly, I want to conclude by saying thank you to the powerful female mentors on this panels and ones not represented here; mentors who transcend the need for a ‘Mother of GIS’. Dr. Victoria Fast is a recent doctoral graduate of the Department of Geography and Environmental Studeis at Ryerson University. Contact her at vfast (at) ryerson.ca. This entry was posted in In The News and tagged Agnieszka Leszczynski, Britta Ricker, crosspost, father of GIS, Geothink, Matthew Wilson, mentor, Mike Goodchild, mother of GIS, Nadine Schuurman, Renee Sieber, Roger Tomlinson, Sarah Elwood, Victoria Fast on April 11, 2016 by Drew Bush. Geothink’s Open Data Standards Project helps publishers and consumers better use open data. We’re very excited to present you with our ninth episode of Geothoughts. You can also subscribe to this Podcast by finding it on iTunes. In this episode, we examine a Geothink project on open data that officially kicked off in February 2015 with a Geothink teleconference call. Project lead Rachel Bloom, an undergraduate student in the Geothink Rapid Response Think Tank at McGill University, began this research one year ago. She worked with Geothink Head Renee Sieber, associate professor in McGill University’s Department of Geography and School of Environment. It recently culminated in a white paper written on two spread sheets (1) an examination of high-value open datasets Canadian cities use; And (2) an inventory of open data standards published by open data providers. Listen in as Bloom explains to partners who publish open data how to know what standards exist and who uses them for which datasets. That’s Rachel Bloom, an undergraduate student in Geothink’s Rapid Response Think Tank at McGill University, talking about domain specific data from sectors like transportation and city budgets. She’s working with Geothink Head Renee Sieber, associate professor in McGill University’s Department of Geography and School of Environment. In late February, Bloom conducted a teleconference for the project’s partners in several Canadian cities. In it, Bloom discusses the project, each spreadsheet, and answers questions from those on the call. She starts with the first spreadsheet. Participants then examined a specific example from the spreadsheet, building permits for the City of Toronto. The call then proceeded to the next spreadsheet developed. “It’s called ‘Inventory and Evaluation of Open Data Standards.’ Here we have on the y-axis these are individual open data standards that are kind of domain specific so they are pegged to certain domains and they cover the ten domains used for the other table. Though there is two extra domains…the metrics you find kind of on the top, are an innovation on my part. They were chosen by me based on the demand of data publishers and consumers I found in my research which came from all different types of mediums. “Rachel can you talk a little about the criteria for whether or not it’s open or not again, it’s whether multi-stakeholders contribute to it, and there was something else too, right, that you said? The teleconference proceeds as Bloom and the call’s participants discuss the spreadsheets and white paper, stopping to elaborate on specific examples or details in more depth. Toward the end of the 40-minute call, Bloom shares the vision and goals for this project. She’s followed-up by Sieber who firsts asks a question and then provides insight into how the project’s goals were determined. At the conclusion, Low offers the municipal publishers perspective on how constantly updated and revised standards make it hard to know which one a municipality should adopt in differing domains such as city budgets, crime statistics, or waste removal services. Bloom doesn’t hesitate with an answer. This project is ongoing and next steps will continue to look at the landscape of open data standards in Canada. This entry was posted in Geothoughts Podcasts and tagged Geothink, Linda Low, open data, open data standards project, podcast, Rachel Bloom, Renee Sieber, spreadsheets, standards, white paper on April 1, 2016 by Drew Bush. 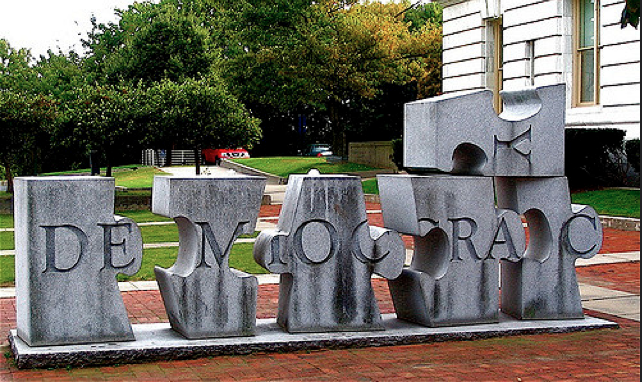 Geothoughts Conversations 2 explores the nature of democracy in an age of open data. The largest grant investigating two-way exchanges of locational information between citizens and their city governments, Geothink makes possible countless collaborations and discussions. This month, Geothoughts Conversations brings you a look at one such conversation that took place this past January on the wintry downtown campus of McGill University in Montreal, QC. We sat down with Geothink head Renee Sieber, associate professor in McGill University’s Department of Geography and School of Environment, and Daniel Paré, associate professor in the Department of Communication and School of Information Studies at the University of Ottawa, where he also serves as an associate director at the Institute for Science, Society, and Policy. The topics: The nature of democracy and public participation and, later, how city platforms that utilize open data impact democratic processes and citizen engagement. Often hailed as a panacea for making government transparent and the political process more open and inclusive, Paré and Sieber discuss the inaccuracies in this narrative along with how open data has changed the roles of cities and citizens in today’s democracies. To start us off Sieber dispels the idea that democracy itself requires public participation and discusses the wide spectrum of democractic systems that exist. Thanks for tuning in. And we hope you subscribe with us at Geothoughts on iTunes. This entry was posted in Geothoughts Podcasts and tagged citizen engagement, Daniel Paré, democracy, Geothoughts conversations, open data, podcast, public participation, Renee Sieber on February 22, 2016 by Drew Bush.